A majority of people in this country support public universal healthcare. Yet no such plan has been discussed in Congress. These proposals have been shut out of the discussion and shot down as 'unrealistic' in favor of plans which preserve the place of the very healthcare corporations which have profited from denying people care and rejecting claims. As Massachusetts residents, we know firsthand that congressional proposals mandating people to buy inferior coverage doesn’t work. Even worse, the latest federal plans include provisions that would drastically restrict abortion access & make cuts to Medicare. We need a single-payer system that covers everyone, including all of their healthcare needs. 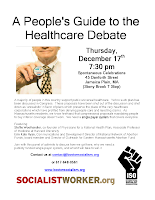 Join with this panel of activists to discuss how we got here, why we need a publicly funded single-payer system, and what it will take to win it.